Don’t want to throw the same old party or hold the same wedding ceremony as everyone else, but not sure how to take it to the next level? 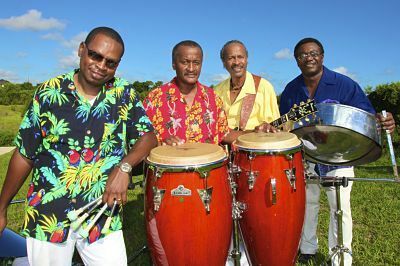 RythmTrail Caribbean steel drum band has you covered. Our steel drum players are all natives of the Caribbean, so we know a thing or two about steel drum music. And with over 20 years of experience, you can trust that your next Orlando event will stand out from the rest. Our band draws from an extensive list of styles, including Reggae, Calypso, Soca, and Caribbean steel drum music. Whether you need a solo player or the full band, RythmTrail is the name you can count on to deliver the music at your next beach wedding or wedding reception, corporate event, birthday party, anniversary, house party, or rehearsal dinner, with some of the best steel drum players in the world. But we’re not limited to local events in Orlando! Our band also travels extensively to weddings and other events from all over the state of Florida, nationwide, and even internationally. Your special day deserves only the best, so don’t trust our competitors’ steel drum bands when our professionalism and quality are second to none. Let us give you the best steel drum music, however you need it. We’ll play for any mood you need, whether it’s romantic or upbeat. If you’d like, you can even provide us with a playlist of your favorite songs for us to play- it’s all about you! See why everyone is raving about RythmTrail, and book us for your next event before it’s too late. Our schedules fill up fast, so call us at 866-495-4522 or get a free quote from us online. Let’s work together to turn your next event into a tropical paradise. Kissimmee FL, St Cloud FL, Ocoee FL, Winter Garden FL, Winter Park, College Park and more. Get in touch with us on the quotation or contact page. Ephraim – Tony and I wanted to properly thank you for an ahhhhmazing job on Saturday. In the midst of everything, we didn’t get a chance to appropriately say ‘thank you!’ You were incredibly easy to work with and did an excellent job capturing our special day. Our guests were equally impressed with your performance and we are extremely grateful for your professionalism and attention to the details of our ceremony. We will recommend you to all our family and friends! Thanks again for a delightful experience working with you and we wish you the best in your business! Thank you for making our party so amazing! I wish I could have you play for us every weekend! Everyone loved the music and atmosphere that only steel drums can create. You were so great and we really enjoyed having you at our home. Hired RythmTrail last minute for our family reunion Sunday brunch. It was the perfect addition to the end of a fun filled week end with family, the music was great we felt like we were on a cruise in the Caribbean. Ephraim the steel drum player is a great musician who knows his instrument every song we requested he could play even some old church songs. Had fun with our steel drummer last night at our Christmas party, one of the best we’ve had so far. RythmTrail was early to set up before our guest arrive, they responded quickly to all our emails and booking was a breeze. Thanks for making our party fun will definitely call again next year. Your band was absolutely fantastic. Even with just 2 individuals playing, many people enjoyed the Caribbean feel that you brought to the restaurant! We will definitely be using you all again come March. Thanks for all your continuous support! Our first wedding event of 2017. Our steel drum band will be playing at Bella Collina in Montverde FL today Jan 7 2017 for a wedding cocktail hour reception. Sat Oct 15 2016 our steel drum player will be playing at a pre-wedding reception and cocktail hour at Cypress Groove in Orlando FL, hire the best steel drum band for weddings, corporate events and parties in Orlando Florida and near by cities. Where is RythmTrail Steel Drum Band playing today Apr 8 2016? Our steel drum players will be jamming in Orlando Florida tonight for a private party. Hire the best steel drum band for weddings, parties & corporate functions in Orlando FL. Today Mar 26 2016 we are jammin at a graduation house party in Orlando FL. Hire the best steel drum players to bring your Orlando event to life. Our steel drum players will be playing tonight Mar 14 2016 at Paradise Cove, Orlando FL for a corporate function. Follow us on facebook and twitter for regular steel drum band postings for where we will be jammin next. RythmTrail Steel Drum Band event update Feb 20 2016. We are playing for the LGS National Walk, LGS Foundation charity event today. RythmTrail will be keeping the spirits high with fun Caribbean entertainment. Live steel drum music, soca, calypso and reggae. The best steel drum band in Orlando FL. Our steel drum band is playing at a corporate reception today at Rosen Centre in Orlando Florida. The best steel drum players, live island music, background music for weddings, parties and corporate events in Orlando FL. Where is the steel drum band playing today? The steel drum band will be playing tonight in Orlando, Florida at the Hyatt Regency International Drive for a birthday party celebration cocktail reception. Get the best steel drum music for events in Winter Park, Winter Garden, Kissimmee, Titusville, Ocoee, Oveido, St Clouds and all other surrounding areas. Our steel drum player will be playing for a sales promotion event today in Winter Garden FL. Book steel drum music for trade show events, conventions & corporate functions in Florida and everywhere. One of our many events this week will be a New Years Eve Party in Orlando FL, we are so excited to be jamming for our fellow islanders, this should be a nice party with guests from Guyana, Trinidad and Tobago, Jamaica and St Lucia not forgetting our USA party folks. Will be a nice “old years day” jam session. Ring in the new year island style with live steel drum music, reggae, soca and calypso. Hire the best steel drum players in the business for conventions, Festival events, campus events, graduation parties, trade show events and more.